South Korea's industry ministry said Wednesday that an agreement has been reached to forge deeper ties with the United Arab Emirates in the energy segment in line with the summit between the two countries. The Ministry of Trade, Industry, and Energy said it has signed a memorandum of understanding with its UAE counterpart, which included plans to establish a business-friendly environment between the two countries, paving the way for South Korean firms to penetrate deeper into the important Middle East market. The two countries also agreed to join forces to seek more environment-friendly growth efforts. 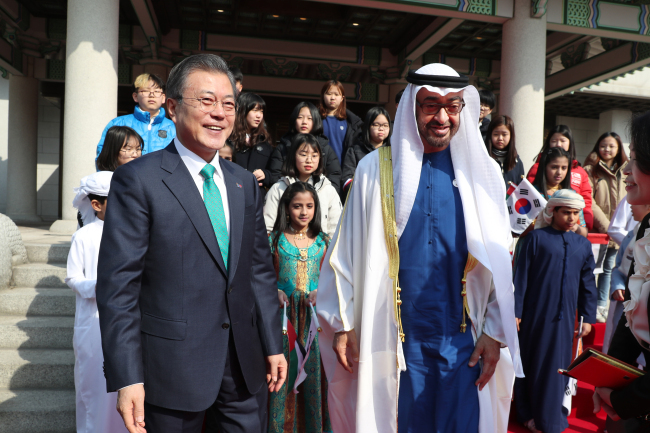 The latest agreement came amid the high-level meeting between President Moon Jae-in and Crown Prince of Abu Dhabi Mohammed bin Zayed Al-Nahyan. Seoul and Abu Dhabi vowed to continue to make efforts to maintain the safety of the Barakah nuclear power plant in the UAE, which is being built by South Korean companies. Pundits said the deal is anticipated to help South Korean firms currently seeking to win the long-term maintenance agreement for the Barakah plant.